In some ways, technology has made us more anti-social. We’re all glued to our phones/tablets/computers with an addiction to staying informed of every status update and tweet possible. Meanwhile, we unintentionally become immune to what’s going on in the physical world around us. This is not to discredit online networks and technology. They have undoubtedly provided great tools to build communities, learn new things, and connect with others across the globe. However, numerous scientific studies have shown that we all share an intrinsic need for physical interaction that you cannot find in front of your computer screen. As the founder of 500 Brunches, I wanted to create physical experiences that would reestablish our social networks in the offline world. 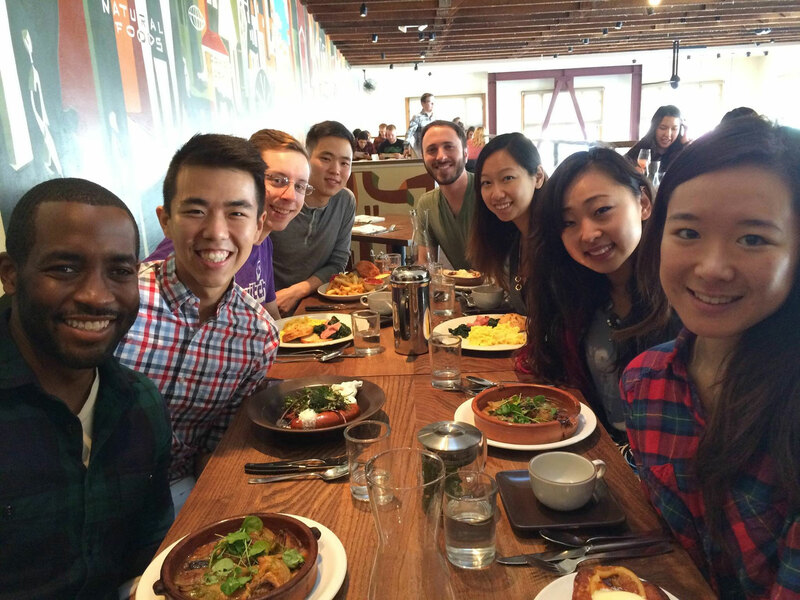 In the process of building 500 Brunches in San Francisco, I have learned that there are really five core reasons why we should all strive to create and participate in offline communities around our work. To ease the fear that many of us have when creating these experiences, I’ve also put together some of the most important things I’ve learned while building offline community experiences from scratch. You can learn about someone’s occupation from their LinkedIn profile or even access their knowledge through online community participation. However, you don’t truly know someone’s tone, sense of humor, or demeanor until you meet in person. At 500 Brunches, even though I see our members’ data and interests in our dashboards, people come alive when we meet in real life. At that point, I form a bond with them about their desires, passions, and what makes them unique. Why is this important? Three reasons: First, I now know how to interpret their communication better. Perhaps they’re sarcastic or shy. I can now read their emails through the lens of knowing their entire demeanor rather than possibly misinterpreting their intentions and motivations. Second, an in-person meeting deepens our bond through a shared experience (more on this next). They are now more invested in my success just as I am now invested in theirs. Finally, as a community leader, I am seen as a real person in the community, not just a name on an email or chat. While you can meet people that share your interests online and discuss topics tirelessly, an in-person meeting has a special magic. I met with David Spinks, our fearless leader at CMX Summit, for an hour in-person a few weeks ago. In that time, I got to know him on a different level than if I had just met him online. I learned about where he was from, heard about his girlfriend, and got to know a more personal side of him. When we confine our conversations to the online world, we often forget that we are interacting with a full human being, with many layers and facets. In the most extreme examples of this, we see what happens when people actually meet their “Internet trolls” offline, and they break down and apologize. Of course, there are the nice members of your community, but sometimes negative behavior exists. Reddit is a prime example of how people can hide behind a computer screen. While working at Yahoo, I communicated with some of our sales reps solely through email, instant messenger, and sometimes the telephone. As soon as we finally met in person, we all wished we had done so years ago. It felt as if we finally knew each other. The next time an issue arose, we remembered there was a real person on the other side, not just a phantom behind the screen. You’ll get feedback from your online community if you solicit it, but observing an offline community take shape is invaluable. You’ll see firsthand what makes people tick and why they find value in the community you are building. From actually attending my brunches, I have learned the real motivations behind why people are seeking out our service and what makes people really connect (or not connect). If you’re having trouble getting your users to find common ground and deepen their relationships with one another, it is likely time to roll out some offline events. If your users really connect offline, they will become even more invested in your brand and the other members in your community. Positive human interaction undoubtedly enriches our lives and can brighten our days. If you give members a good experience offline, they will want to engage further with you and the other people they’ve met. They feel even more compelled to answer that question on your forum or share user-generated content, as they now can identify the person asking for a favor beyond just an avatar. In terms of getting people more deeply engaged, meeting offline moves them through the commitment curve a la Airbnb’s model, so that you can make bigger asks in the future. 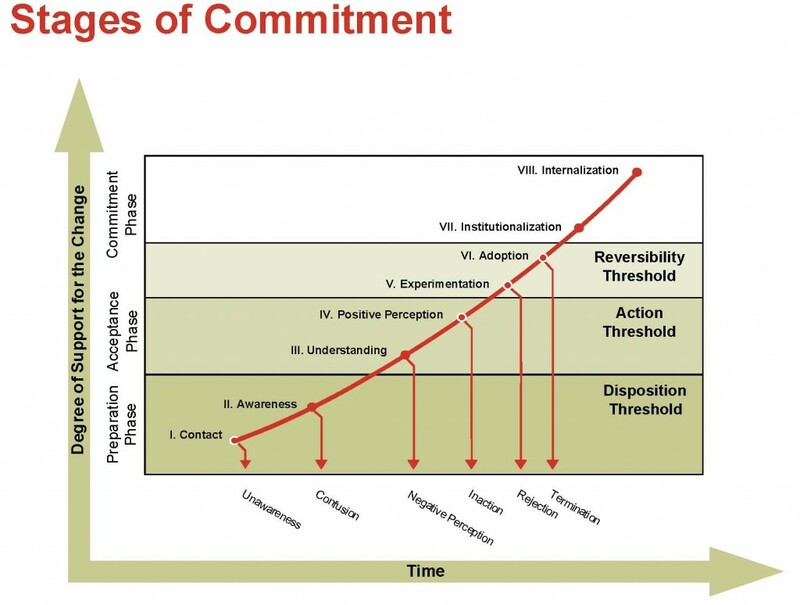 The Commitment Curve Model from Daryl Conner. Offline events are a solid form of contact that moves people up the curve. While we can share reasons for building offline community for days, actually hitting “go” and running with it can be a different matter altogether. Let’s face it: bringing people together offline can be scary. It is unpredictable. But it is necessary to take the leap in order to achieve amazing connections. 1. Provide people with a purpose. Set a purpose for your event and empower attendees to prepare for the event by providing information on the topic(s) and some initial questions to get the conversation started. Allow for organic conversation as well, so it doesn’t feel too forced. Another great way to give purpose is to call for volunteers or give tasks to attendees when they first arrive. This reduces the level of uncertainty involved, gets people to move around and actively communicate with one another, and mitigates first-arrival awkwardness. Find a convenient location/time and give attendees enough notice about the event (we typically send invites a week and a half from the event). As we’ve learned before from Product Hunt, Eventbrite, and Yelp, you need to share more information than you even think you need to share. Share it often. Remind people 1, 2, and 3 days before the event about all the details like parking, what to do when you arrive, and what to expect. Overbook your event and account for cancellations. Keep in mind, the average free meetup has a less than 50% attendance rate. At 500 Brunches, we make ours closer to 90% with a small financial buy-in and cancellation policy (even charging $5 makes a difference! ), but we still account for the possibility of flakiness or unplanned circumstances. You should too. 4. Bring in a trusted network. Find a trusted network to help ensure that people attend your first event. This could be calling in a few friends/co-workers who you know will show up (but make sure they bring value to your event). One of the scariest feelings before hosting an event is the fear that no one will show up. You can do some prep work to relieve that feeling through direct, personal outreach beforehand. Honing in on a few of your key online community members, or using a trusted platform to help find users/organize also helps (feel free to reach out to 500 Brunches if you are in the Bay Area right now!). The first event is always the scariest, but if you plan accordingly, you’ll have a great turn out! Get started! Every community is different, so know that your event will be unique no matter what size. Remember to plan the size of your event based on your members: If you don’t have a huge user base (under 100), plan something small (like a brunch!) to get started, as opposed to a huge party. You have to assume that many guests won’t be able to come due to logistical issues with their schedule. If you set the expectation that it will be a small and intimate event, guests will be happy rather than disappointed when they only see 6-10 other guests. Also, it’s never a bad idea to bring backup plans in case your event is small, such as asking people to fill out a fun survey at the end (hey, you just turned your event into a little bit of user research!) if there are only a couple of people in attendance. What Companies Are Doing Offline Community Strategy Right? There are tons of online products/services that use offline communities as a key strategy. As you’ll see, these are not necessarily small startups (Microsoft hosts user groups and they certainly could not be classified as such). Anyone can bring offline strategy into the community mix. Product Hunt is a prime example, as they regularly host happy hours and brunches. They also allow their users to take ownership of meetups at any time. Polyvore is known to use meetup-style events to learn more about their customers and enable their users to meet one another. Pinterest did something similar at the outset to galvanize their most vocal users. 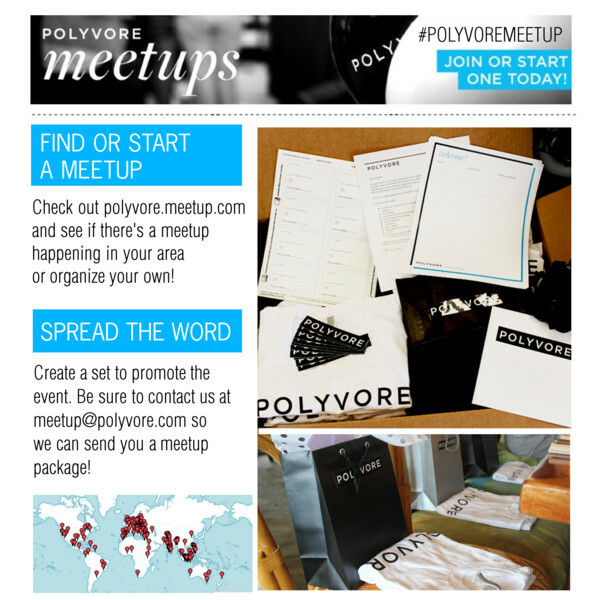 Polyvore Meetup Page — This is similar to what Tumblr provides for their users. Tumblr allows users to host their own meetups wherever in the world they may be. CreativeMornings is a lecture series that happens in over 100 cities around the world. The entire purpose of CreativeMornings is to spread amazing ideas about art, culture, and design. It has now become a global movement to open up about topics and talk through assumptions that many of us take for granted in our daily lives. You all know that running a community takes hard work. Adding an offline component is no different. But with the right care, attention, and involvement, it can be a winning strategy to bring your community to the next level. It really does make people feel like they are actually part of a community when they can put a face to a name and share a concrete experience. Sharing real conversation, laughs, (and maybe even good food) will enable your customers not to just feel like a community, but to become friends — with you and with one another.